We love pets, they become members of our family from the first day and we spend amazing years together. Right now we have three birds, while they are cute and funny, taking care of them can be challenging for young children. When I first saw Little Live Pets products I was very impressed how they are designed to bring real pet experience for kids. Little Live Pets are more than just toys, they are special and unique friends every child wishes to have and play with. They are created to bring the most exciting adventures to our children. We received three amazing sets and Teddy has such a good time playing with them. 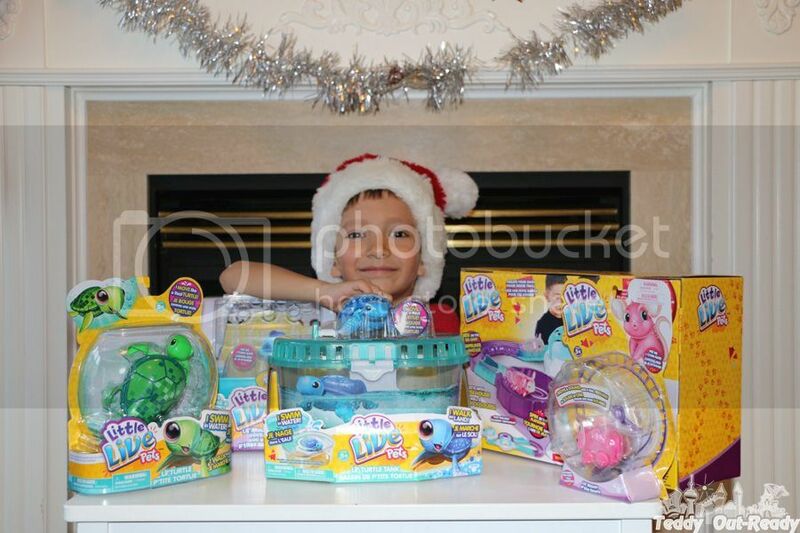 The first one is Lil’ Turtle Tank along with Wave The Surfing Turtle toy. It is amazing how turtle moves and feels in your hand almost like real one, even when you touch the shell it feels like real little turtle. It can swim in water in Lil’ Turtle Tank and crawl around. Wave The Surfing Turtle has four more friends in its turtle family and you can collect them all to play, they are all unique and has own name. A child can choose favorite one to play or play with them all. Second set is Lil’Mouse House, where you can find a cute little mouse having fun in its cute house. Our Snippy loves moving around and spinning in the wheel. It is very fast and makes over 25 unique sounds. I like that this little mouse house can be taken anywhere to play with, plus it is lightweight and easy for grab for children’s little hands. For even more exciting experience there is another great Little Live Pets toy set: Lil' Mouse House Trail. This one is a total fun adventures for children when they watch how little mice run around. A lovely family of mice including Blossom, Rosette, Snippy and Fripon are never quiet, never tired and always want to have fun running back and forward. They also slide along the ramp, turn around, bump into each other and continue their wild run. The good thing you can connect the Trail set with Lil’Mouse House to build a little city for your pets so they can run and spin around. I like these toys meticulously designed with strong attention to details, the pets feel and behave like real ones. For example, turtle shell, head and legs moves, or mouse spin. We found these are great toys to teach kids some compassion and understanding about animals, their behavior and even mood. There are different pets with own name and personality, so children find favorite ones. Teddy likes Snippy and Digi the Gaming Turtle and I like Blossom the most. Overall, Little Live Pets have amazing toys and make perfect gift for children this holiday season. Pets are often best friends and children love playing with them. For more information about Little Live Pets, please visit their web site and find them on Facebook. Available across Canada at major retailers like Toys ‘R’ US, TV Showcase, Loblaws and London Drugs.